We can't change the weather. But we can clear your path. Central Alberta is blessed with snow for up to half of the year. ALS can keep your property safe and accessible year round, in spite of the freezing temperatures and abundant snowfall common to our region. 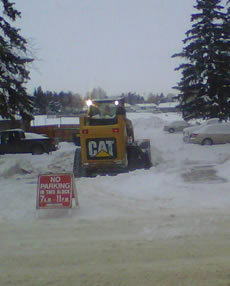 Alternative Landscapes is available to keep your parking lots or access roads clear of snow and ice. Plowing is completed for all accumulations greater than 5 cm, or as requested. Regretfully we are unable to take on more residential sidewalk clients at this time, but we are always available for larger equipment work (commercial clients, parking lots, and access roads). Please call for a quote.